Well, it has not been officially launched yet, but the oil company campaign contribution site we’ve been working on for the last six months is live. It leaked out on blogs this week, and has been getting good reviews and tons of traffic. We are excited! The site is a project of Oil Change International and another collaboration between myself and Greg Michalec. 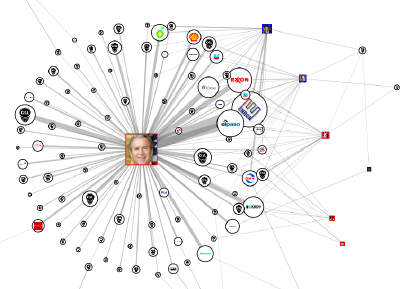 It shows interactive network maps of campaign contributions to presidential races and members of congress. 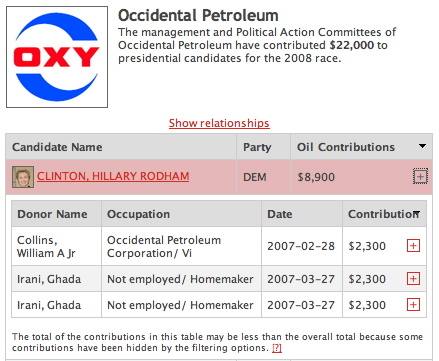 The same data is also shown in drillable tables, so you can go from a politician, to the contributing oil companies, all the way to the image of the original FEC filing. It also permits searching for congress members by name and constituent zip code. The site is a lovely example of greg’s Ajax wizardry, as there is not the slightest bit of Flash used anywhere in its construction. We’ve tried to build it as a PHP framework for wrapping the functionality of Graphviz (and other SNA programs) and linking it to mysql databases of relational information. This means it should be fairly easy to adapt it to other data in the future. ‘Tho as always, some of the elegant architecture got hacked to pieces by the specific requirements of creating a useful UI. The graphviz opensource community has been quite helpful, making several changes to their application code to add features for us. How do you show 78,000 contributions from 6000 companies at the same time? It has been a real challenge to figure out how to present this data in ways to make it understandable for multiple audiences. I’m still not sure how to explain the filtering in ways that make sense, but we needed to have ways to trim out the ‘lighter-weight’ relations so that there were so many edges the graph turns into an uninterpretable blob. I also think it is interesting that people who are used to thinking very logically about data love the table view and hate the network maps, while many people have the opposite reaction. It is difficult to figure out how to present data to encourage relational thinking, or if it is even possible. So what we’ve tried to do is make it so people can swap transparently between alternate views of the same data. 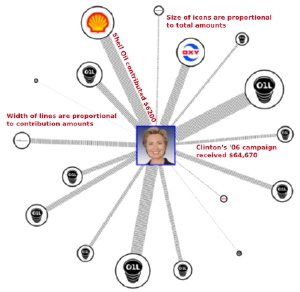 I found the site (as a white haired non-techie granny) easy to use, informative, fast, and especially liked the take action part, which for me is related to the gestalt of the graphic info: electees from oil states (texas, la, ok) get lots of oil money. Oil money to our Oregon reps is negligible. Are their reps who have a policy of not accepting oil money; or whose policies are such that they are not a target for oil money? (i.e. why does Wyden have no oil money in the last few years? and, in reverse, why does Gorden Smith have a great deal of oil money a few years back? Was that blip related to an issue? an out of state effort to re-elect a republican senator? Which is more sophisticated perspective than most people usually bring, much deeper than the basic ‘who got the most’ question. One of the most important contributors is the tightly held Bass Brothers oil company. So secretive, we can’t even find a logo for them to put in the network. How about it folks, somebody want to take a picture of the logo on their headquarters in Texas and send it to us?